At 6 years old, 15 months old, and newborn, the diaper bags are forever around. Sure some of them aren’t the traditional diaper bag but all three of us still need those essential items for our kiddies that we need to lug around in our bags! Sheena has now moved on from diaper bags to backpack for the boys, Dipti is still lugging her one diaper bag around and Nina just transitioned from diaper bag to backpack. The content of the bags are so different- from age to gender – it’s all over the map! Check out what’s going on in our kids’ diaper bags! My diaper bag has been through many evolutions. 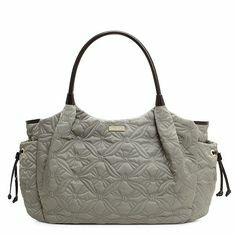 When the twins were born I was more concerned with fashion over function, so I started with the Petunia Pickle Bottom Boxy Diaper Bag. It was perfect for the first 8-10 months because I was able to fit small things the kids needed and it had a folding changing pad attached right to the front of it! Then came the walking toddlers and my third guy and all things changed. At first, I added the Coach Baby Bag to my collection just for Saiyan. After he grew into a toddler and was able to keep up with the twins (which was very quick) we switched out to a backpack instead of any diaper bags. 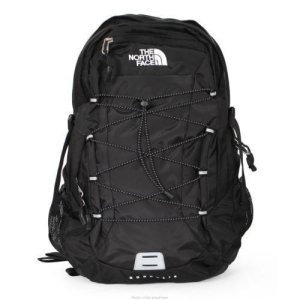 I chose the Northface Jester backpack because it is great quality, the perfect size, and can easily be carried by mom or dad (who was not feeling the “cute” diaper bags I picked out). With all the new found space, this backpack was the perfect “kids bag” for us! Being that two of my boys have nut allergies, an EPI pen is always a must and lives in the bag. My boys (as most boys are) are very curious and love to explore, so they have their hands in everything and anything (even picking up bugs, yuk)! Needless to say, we have to stock up on sanitizing wipes and always have a huge stash in our bag. Now that my boys are older, their attention span is also not the same as it used to be. We used to get away with coloring books, singing songs, telling stories, etc. but in this new day and age, electronics have taken over. We try to stay strict about hours on the ipad/tv but sometimes in emergencies or to avoid a complete meltdown, we have our handy iPad on hand (this Ipad case is amazing for kids). Another handy item I wanted to point out is this water bottle. The water bottle is $4 but is the best one ever for a few reasons! 1. It keeps the water cold, 2. It has a hook that fastens onto the lunch boxes if need be and 3. It has no plastic parts of a straw which I absolutely hate cleaning and maintaining. And after all, if they loose it, no big deal 🙂 Other than that, we have the basics, a change of clothes (easier now that all three are in the same size), toys (mainly Legos as that is their new obsession these days – especially the mini-figures), snacks and a pack of tissues. Now that D is walking/running around the world, his baby feet need some protection against the rough world (I know, I sound like a first time mom). Shaan and Shailin passed these Stride Rite shoes down to their baby brother for his first steps. They are perfect for the Summer and help keep his balance while he’s learning to explore on his own. Along with the running around, his appetite has grown and he needs constant replenishment. He loves these Organic Plum pouches and they’re super easy to feed on the go! He also loves his water and will only drink it out of this one straw cup so it goes wherever we go – thankfully Playtex still sells them so we had to stock up incase he lost it! D is also going through a phase of only wanting to be outside at all times of the day. We use these Bugables bands to protect him from bug bites (and we also put diluted tea tree oil on him in the morning). The good thing is that they have minimal contact with his skin and seem to work! And like any other kid, D loves his phones! His big sister Naya gave him her pink toy cell phone and he does not part from it! We’re scared he’s starting to prefer the real thing over the toy but as long as it gives us 10 minutes of entertainment, it comes with us! Up until Nesa’s birth, I swore by the Kate Spade Stevie Diaper Bag. It was the best thing since sliced bread for me. BUT now with three to tote around and with completely different needs, a big open bag just seemed daunting. 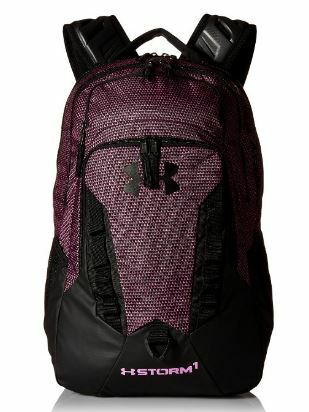 So I took to my big sister’s experience and switched to an Under Armour backpack. With all my hands occupied, it seemed easier to just toss this bag on my back rather than carry it like a purse like I used to with the old bag. Not to my surprise, backpacks hold SO much more “stuff.” Right now I have to take along extra clothes, blankets and burp cloths and bibs for Nesa as you never know when you will need any of those things! I also always have a bottle of water on me because I’m nursing and have to stay hydrated. I usually pick a bottle I can easily refill. I also buy these Disney Play Packs for the older two which I can usually find for less than a dollar at the local grocery store so I’ll buy 2 each of various themes to avoid any fighting! They have a coloring book, crayons, and stickers which entertain the girls for a while. With 4 girls, mommy included, ouchless hair ties are an absolute must. I have a little pouch in the bag with all these little essentials (hair ties, bobby pins, safety pins, flower pins, headbands, etc). And last, but definitely not least, is hand sanitizer. I’m not too crazy about hand washing, but any time I or the girls are in a place with lots of kids or germs or both, that sanitizer gets used frequently.